Due to the health threats associated with asbestos and the prolific use of the material in industrial applications, the Occupational Safety and Health Administration (OSHA) requires facility managers to notify their employees regarding building materials that contain or are suspected to contain asbestos. Facility occupants should be aware of asbestos containing materials in order to take all proper precautions when working in an environment where asbestos may be present and to avoid activities that may damage asbestos containing materials and cause fibers to infiltrate the air. If you believe that you have asbestos in your facility, do not panic! Do not disturb asbestos containing materials that are in a stable condition. Generally, asbestos containing materials do not pose a health hazard unless the microscopic fibers become friable and infiltrate the air. Carefully inspect suspect asbestos containing materials regularly for signs of wear. If you notice deterioration or damage, notify your facility manager. If you encounter damaged asbestos containing materials, follow certain precautions. Do not further disturb the materials, cause excess movement to create dust in the area or attempt to remove the materials. Immediately notify the Directorate of Public Works Asbestos Program Manager at 432.3564. This sign indicates the presence of asbestos. Exercise caution in such areas. Only individuals who are specially trained and properly equipped should perform operations that may disturb asbestos containing materials. When working in an environment containing asbestos, these individuals should always use proper personal protective equipment (PPE). Proper PPE includes a respirator, a disposable coverall with attached hood and boots, eye protection and impermeable gloves. Furthermore, asbestos is a regulated Class 9 hazardous material. Proper disposal is imperative. Asbestos containing materials should be placed in a labeled six millimeter polyethylene bag in a secure labeled dumpster. If you notice suspect asbestos containing materials that are not properly secured, contact the Asbestos Program Manager. Don’t remove materials that may contain asbestos. Don’t renovate or disturb building materials without approval from DPW Customer Service and the Environmental Division. Don’t store items in mechanical rooms where asbestos containing materials may be prevalent. 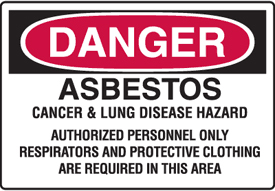 Don’t dust, sweep or vacuum debris that may contain asbestos. Don’t saw, sand, scrape or drill holes in asbestos containing materials. Don’t sand or try to level asbestos flooring or its backing. When asbestos flooring needs replacing, notify DPW. Do have a facility thoroughly inspected by a North Carolina accredited asbestos inspector prior to any renovation or demolition activity. Do have removal and major repair performed by North Carolina accredited asbestos professionals. Do contact the DPW asbestos program personnel to collect samples of suspect asbestos containing material. Do keep activities to a minimum in any areas such as crawl spaces or attics with damaged materials that may contain asbestos. Do take every precaution to avoid damaging materials that may contain asbestos.